It’s been a busy, fun, exciting year for iOS music app development. There were great new discoveries, and amazing big updates that showed off what our iOS devices can do musically. I don’t think it’s an “If” any longer regarding capability. Now it’s just about “How”! How we use all these great new tools and amazing music apps with our chosen devices. It’s time not only to reflect and recall what moved us this past year in so many ways musically and artistically, but to also believe that big, professional, quality sounds can be crafted to create big quality music in many genres that can equal a big studio sound. This past year in iOS music has really leaped forward, cementing the proof that big sound can come from tiny sources, and you do not have to invest in big studio gear, or powerful computers. It’s a revelation of how music is made, and mobility is one of the larger aspects that attract so many people. Virtual Core MIDI & Background Audio are becoming increasingly useful and in my case vital. Will VCM replace ACP? Will developers increase their support of truly mobile music by removing all requirements for external tethering? Will we see a full fledged (Not really very likely with current iOS hardware) DAW? Who knows? I do hope the answer in 2012 is yes all around, especially the mobility part. These are mobile devices; requiring wires or external hardware to fully utilize them is old-time thinking that slaps mobility in the face. Perhaps the hardware isn’t ready yet for all the things we might hope for, but surprises continue to prove the doubter wrong all the time. What follows is a short list of the music apps I think took iOS music to the next level in 2011. It’s been a huge struggle to choose, but it came down to what really got used the most on my iPad, and iPod Touches. Full of the best that history has offered us in hardware drum machines and then some. Loaded with possibilities, ease of use, and crazy fun. Even without ACP it’s hard to deny its greatness. 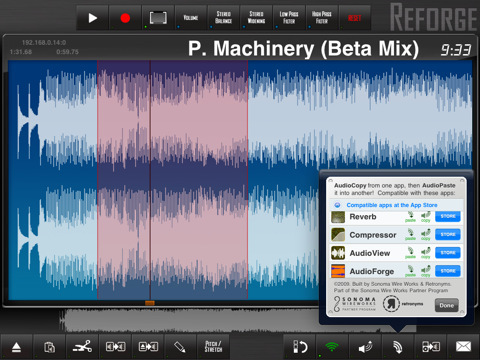 Audio Editor of the year- Reforge Wave Form Editor by Audio Labs. Simple, fast, and gets the job done. Despite some stability issues, Reforge became my number one editor for my audio bits. No clutter, and light on FX, yet reliable and clean. That’s what kept me coming back to Reforge the most in 2011. 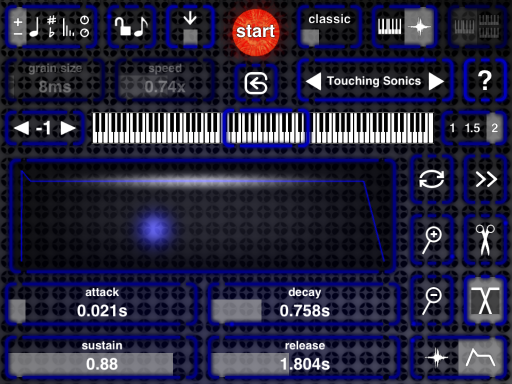 Sequencer of the year- iSequence HD from Beep Street. This is one I discovered rather late in the game, but almost instantly became my preferred go to for detailed sequencing. Sampler of the year- SampleWiz. From Wizdom Music. Creating, sampling, re-sampling, tweaking and all in all one of the more unique interfaces I’ve seen. This made sampling fun. MIDI Controller of the year- Sound Prism Pro by Audanika. This is how wireless is done! With beautiful design, and complex chord progressions, virtual controller and much more. This is just amazing. 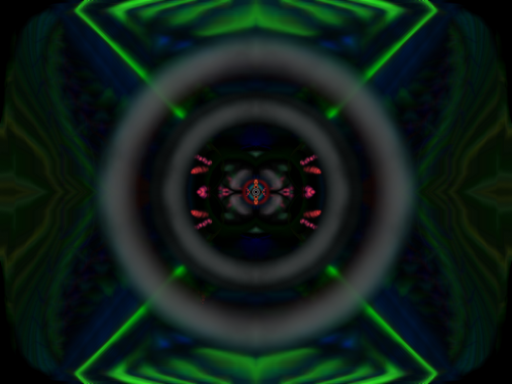 The Virtual Core MIDI app. This was the hardest to choose. In the end it came down to just what got used the most from my collection of iOS synthesizers. Addictive offers so much functionality and possibilities. Not shy on power and complexity, but not difficult to use. Even before the addition of Reverb and Delay, this app with the 24 tracks has been my work horse for arranging most of my music, including %70 of my album Technopolis Lost. Nothing works more reliably, delivering professional audio, and leads in the user friendly department. This is quality. 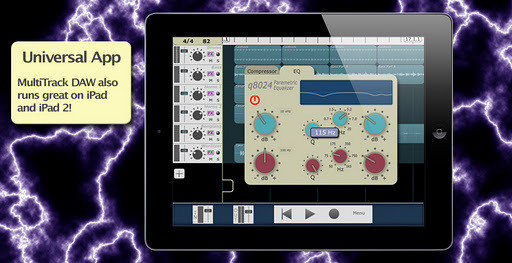 Thanks to Blip Interactive for the monumental updates bringing Nano Studio from 6 track cool to iPad Native, and 16 (via IAP) track bliss! With programmable TRG pads galore, powerful Eden Synths, great FX, mixing, editing, easy wireless sharing, and more all wrapped into one Nano package. iOS Music App Of 2011- Animoog By Moog Music Inc.
Of all the amazing new music apps (including those updated in during the year) Animoog arrived with a huge bang. Maybe not the very first, but certainly one of the very best professional music apps to ever grace both the iPad and iPod Touch screens. A unique retro interface designed for functionality and with an expressive use of the touch surface. 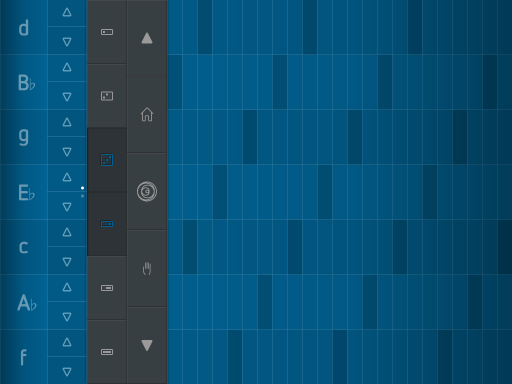 This was one of many new amazing iOS synths, and music apps that stood out sonically. Entirely usable, and perfectly beautiful, Animoog is a game changer. Here’s to all the great music apps of 2011, and cheers to a what was a big year for iOS music. I know some big developments are going to show up in the new year, and there’s lots to be excited about for 2012! A fellow artist and loyal reader suggested maybe doing a question and answer series of blog posts on the topic of my process for creating chill, ambient electronica using just iOS devices and apps. The idea of interacting directly with readers is far more interesting to me then just writing out what could be a very boring and long blog all about me. I much prefer approaching this topic as a dialog. So I’m going to give it a shot, and this is my first post in what may or may not be a long or short series of blog posts about my process. Currently I have a large collection of readers questions compiled from Twitter, Facebook, this blog site, and private emails. So there is no shortage of things to discuss. I’m sure more questions will come up, and I do welcome them, so please let me know if you have a specific question that you wold like my thoughts on. I say “thoughts” because I don’t have all the “answers” and I can only offer information based on my own experiences, I can’t claim to be right or wrong, this is just about how I do it. Q 1. What apps, if any, do you consider your “core” apps? A: This question isn’t as cut and dry as one might think. My “core” apps include one or more of the following, a soft synth, drum machine, sampler, audio editor, sequencer, and a multi track recorder. Now, I have several that I use in each category and many many more. In the interest of keeping this brief i’ll name the ones I use most regularly now and also from my album. Addictive Synth, iElectribe, Filtatron, Reforge HD, *iSequence, Nano Studio (all around use including performing and arranging beats and samples etc) and MultiTrack DAW is mostly where I put it all together and master the song project. About %70 of “Technopolis Lost” was completed in MT DAW, and all before it was updated with Reverb and Delay. 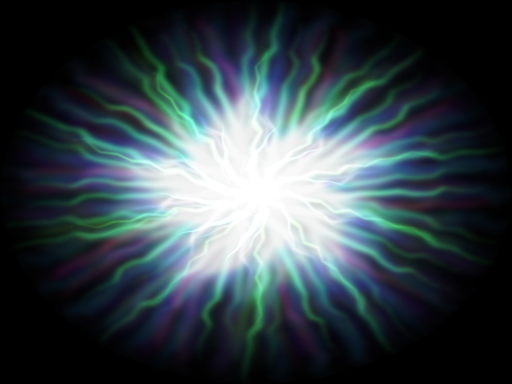 The remainder was made using Studio HD. *iSequence- I got this app after my album was completed, just to be clear. I use it a lot though now. 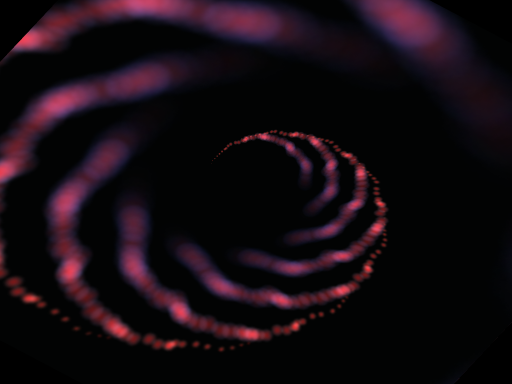 Also, I use Looptastic a bunch in my earliest work as well. Some of that work also made its way into the final cut. Q 2. Are there any workarounds or shortcuts you have developed to deal with interoperability issues? Examples might include apps without ACP, or perhaps mixtures of apps with Intua Pasteboard vs. Sonoma AudioCopy, etc. A: I really almost never use any iOS music app that doesn’t have a record function and also audio copy paste, capable of audio both into and outbound. Since I’m committed to being totally wireless I’ve had no other options. I admit that early on some of my first experiments were with some apps that had no ACP capabilities at all. That was a while ago and I was using my iPod Touch mostly back then. When I discovered ACP it was all over for wires. I never looked back and I just don’t care for any apps that don’t have ACP. They are unusable for me. While ACP isn’t the “best” solution, it is currently the most practical (Virtual Core MIDI could replace ACP, and I have high hopes for it) and also a fundamental requirement in my process, including deciding whether or not I will use an app in my work. Besides, if I wanted to tether things together I’d invest in a studio. I prefer to have the freedom to make music anywhere I want without needing anything other than my iOS devices. I feel strongly that an app without audio copy paste, and of course recording are totally missing the point of mobility. They may as well just be for computers only, as far as I am concerned. I feel, why bother with the hassle of wires and other hardware? It just seems so backwards and primitive considering that simple coding in an app could do away with it needing to be wired to anything else. I understand a lot goes into creating an app, I just don’t bother with apps developed for a mobile platform that actually can’t even be used to their fullest potential while mobile. I love the virtual studio concept. The last question in this first post on my process is from “Rodi”. The question he asks is actually also one I’m asked in one form or another very often. Q 3. Where do you normally start? Just playing around some apps then finding a cool sound or pattern and continue from there or do you have a clear path set ahead and use the apps most suited for it or maybe somewhere in the middle? A: Often where I start can be also where I had once left off. I mean that sometimes I just get an idea, start creating pieces that sound good together and arrange them. However at some point I might have discovered that it wasn’t working out at all, but I managed to find inspiration in certain pieces of the failed project. Those pieces then become the beginning of something else, and that’s really how many of my tracks began. Also, more to the point, if I come up with an idea I will almost always start with a synth by creating a patch that sets the mood I think will be the basis of the concept I have in mind for a song project. So yes, many times I just found myself creating a cool new sound, arpeggio, or sequence. As far as having a “clear path” goes, maybe not so much as I’d like to admit, but I do usually start with a concept. Take my track “Glacierized” for example. That was all about the slow passage of time, like how a glacier moves relative to how we as humans perceive time moving in our lives. I created what I thought was a pretty good simulated sound of a rumbling, crackling, huge body of ice slowly traveling throughout time. Then I composed the track going by how it made me feel while keeping it on the path that I imagined. I think it worked out pretty good. So that’s my first entry in what I hope will be an informative series of Q & A style blogs about my music crafting process. I will answer more of the questions I have received in my next post. Thank you to iCliffDotMe, and Rodi for the great questions. As always I welcome comments, emails, and more questions. just like a lot of folks. Just one last thing please. Thank you, and um, hey…my album (see top right sidebar for details) makes a nice gift for friends and fans of electronic music, or folks that just want to hear something different and chill. CD Baby. It’s also available digitally (they charge more) in iTunes, and at Amazon.com as well. Also does the karma good to help an artist during the holidays, 😉 your support means the world to me.